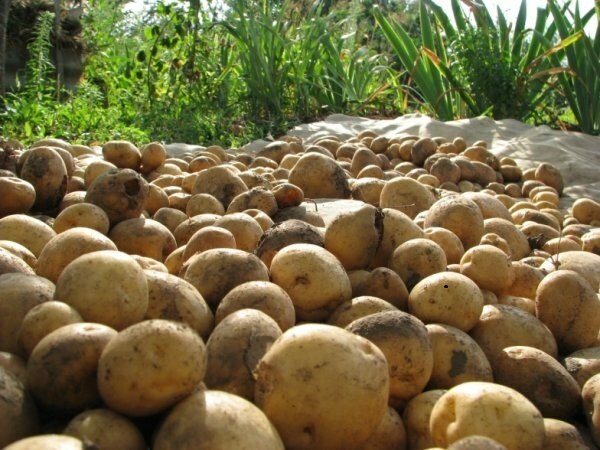 Timely harvesting potatoes helps to fully ripened harvest, suitable for long term storage. If you dig ahead of time – the tubers are immature with a weak peel. Overexposure in the earth threatens the development of sheath blight, which significantly shortens the retention period of the tuber. Approximate dates of harvesting of potatoes of early varieties from August 20 till September 1. Late and mid-season varieties, you can dig up from 10 to 25 September. In most cases, it is necessary to focus on the state of the foliage. If it is a large part podvala and began to dry, it's time to mow, leaving small stumps. For early varieties of potato tops removed 7 days before digging. For late and mid-season varieties – 2 weeks. Unfortunately, the Northern areas are not always able to determine the harvest time based on the condition of the tops. Very often severe frost kills all the leaves considerably before time. To begin to harvest, you need to focus on the average time of harvest or to dig a few bushes. If the tubers are fairly large, skin tight, you can start digging. For summer use the potatoes you can start opposed to undermine from the beginning of August. In some regions, early varieties of potatoes can be eaten already from the third decade of July, the tubers at this time is large enough and not watery. It is permissible to dig the potatoes without cutting the tops. This method is used by most gardeners, if a potato field is small and the harvest will be scheduled using the round-pointed spade or fork. If you are not sure which variety of potato is planted on a plot, it can be easily determined by digging a few bushes. Early potato skin becomes crisp in August. If you try to scrape it with your finger, nothing happens. Late and mid-season varieties in August are still weak rind, which is easily scraped off with the finger and removed with washing. If the frost has damaged the leaves, all dried up shrubs, you can dig up to 1 September, the green bushes leave to ripen until September 15-20.